Please join us on Saturday at 11th and Broadway, in front of the old St. Denis Hotel, for a demonstration to save our neighborhood. The historic former hotel, built in 1853, is to be demolished for a large glassy office tower. This is part of a broader trend of demolitions and completely inappropriate new development in this area south of Union Square, fueled by a lack of zoning and landmark protections, the expanding tech industry in the area, and the commercial upzoning for the Tech Hub recently approved nearby on 14th Street. That deal, passed by the City Council and local Councilmember Rivera, failed to include any of the promised meaningful protections for the affected adjacent Greenwich Village and East Village neighborhoods. 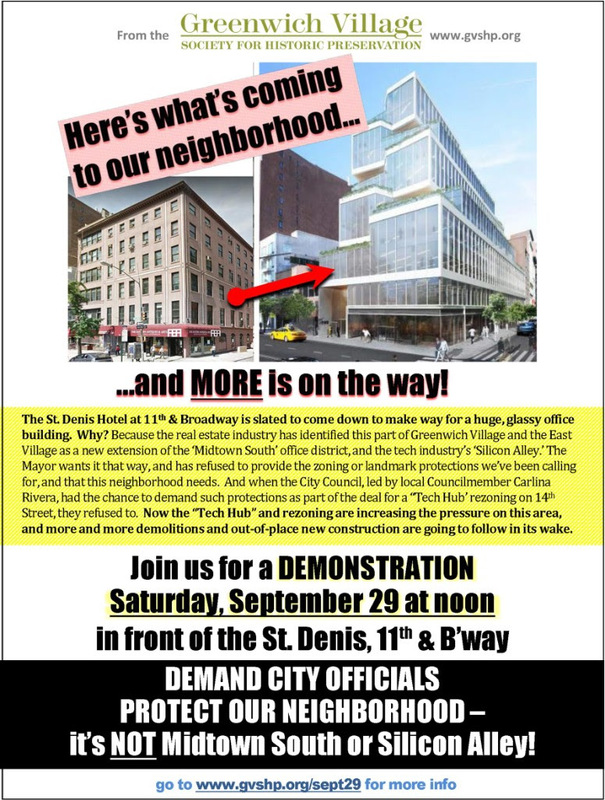 Developers now increasingly see this area of our neighborhood as an extension of the ‘Midtown South’ office district and of the tech industry’s “Silicon Alley” ... we are continuing to push for landmark protections that will preserve this and other buildings in the area. Find more info on the rally here.